Within last few months I was introducing tests into untested code. It was not old code, just some code that was not Unit Tested. As much as I was eager to do so, I found myself getting in a bit of a pickle. Code was actually quite complex and difficult (smell) to understand. I was also a little scared that I will misunderstand the code and its intention. I assume that I will not be the only person facing this problem while working on the piece of code. Fortunately there was some testing coverage in a form of a higher level Acceptance tests (not sufficient though). I decided to refactor the code a little to make it more manageable. Extract few methods, rename few variables, remove unnecessary conditions and loops, etc. When I finished refactoring and made sure build was still successful, I checked in the code and off I go to write some Unit Test. That was the point when I hit another brick wall. Necessary dependencies in a class that I wanted to test were not provided to an object upon creation, but were instantiated internally. This means that code is not flexible to changes in a future and is impossible to test (smell). Making all the dependencies passed through constructor will make it more obvious to what the class will do, and make it possible to unit test. So, after some refactoring again, building and submitting the code, I had my dependencies all wired up through constructor, just the way I like (mmmm, delicious). Many of the dependencies were still concrete classes. Pity, actually you don’t care what’s in the guts of your collaborators (most of the time) as long as they do what they indicate. This could be replaced by interfaces (or some abstract types in worst case) as dependencies. They also make it easy and simple to stub or mock your collaborators, so the testing is simpler to setup and you’ll be testing only the correct object. Another refactoring session ended in a bunch of new interfaces. So I started to write a test. I created my object and started to pass some dependencies. The problem was that I had to pass some other dependencies to those dependencies, and dependencies of dependencies and even more dependencies and … you know where this is going. This great monster had too much setup code than the one I was going to test. This got me into thinking that something was not right. The thing was that the tested class was trying to do too much. This was the main reason of mentioned previously code complexity. Testing was not easy and possibility of introducing new bugs during future changes was great. So, extracting few methods here and there (around same functional area) and I was able to pull those methods into new object. This new class was very simple and was responsible for one area of functionality only. I could unit test that new class. Last problem during the tests was that I got some unexpected behaviour. As I looked into the code it turned out that there was one more smelly thing left. There was some code that was calling to a static method of another class. It was impossible to mock or stub it. What’s even more horrible, it was using some internal static variables. That caused some un-expected behaviour. As it turned out, I found problems in a code even before I started to write a single line of test. Just thinking about the ways to test, revealed first issues. More of the issues appeared while testing. The work I had to do in order to make code tidy, simple and testable could be avoided by writing it in TDD/BDD way. These days, computers made multitasking a doodle. In the same minute you can read this blog post, chat with friend on IM, check your email, Facebook or Twitter account, perhaps even do some work. We can switch our attention quickly from one task to another. But … is it good for our brain? Is it good for the work we are doing? Are we really more productive? It’s been few weeks since I started to talk to people about context switching and multitasking. Most of them recognize it as an issue. Many agree that it is counter-productive. I decided to take closer look at the problem and do a little research. Here are the results. According to many Neurologists and Psychologists our brain was not designed for multitasking. In 1999, Jordan Grafman used MRI to scan people brain. He discovered that frontal cortex of brain of people engaged in multitasking was more active than any other. This part of the brain is the least known to science, it is said that this is “what makes us human”. Psychologist René Marois discovered that there is a bottleneck in the brain, when it’s being stimulated to perform more than one task. David Mayer thinks, that rather than a bottleneck, brain has a process that helps to select and prioritise tasks and obey any instructions that are not on that list. Russel Poldrack, a psychology professor found that “multitasking affects the way you learn”. He discovered that people who multitask while learning, use the part of the brain responsible for learning new skills (striatum). Rather, they should be using part of the brain responsible for storing and recalling information (hippocampus). There is a dozens more of scientists that have done research in brain and psychology area that will confirm the fact, that we work better if we focus on a single item. This is the great irony of multitasking–that its overall goal, getting more done in less time, turns out to be chimerical. In reality, multitasking slows our thinking. It forces us to chop competing tasks into pieces, set them in different piles, then hunt for the pile we are interested in, pick up its pieces, review the rules for putting the pieces back together, and then attempt to do so, often quite awkwardly. It is easiest for me to talk about multitasking or the process of switching tasks (context) when talking about software development. During our development process quite often we are getting in the state which is defined by Mihály Csíkszentmihályi as the Flow . If we are getting interrupted or interrupting others it’s the Flow that suffer. Think of the number of times that email, phone, IM chat, news ticker or anything else that interrupted your work. Very often we drop whatever we are doing and we answer an email. We are voluntarily destroying our context, switching to another one, just to get it back on track minutes later. This comes for a cost. It cost time and your focus. It is a typical distracter that actually we have control of. We can also get interrupted by other people. Project manager, team leader etc. comes to us asking to stop working on whatever we are doing and do something else instead. Something small and quick, that is only going to take you 5 minutes. So we do that, and then we consume our mental energy on getting the entire context of interrupted task back on track. When we are in a despair and need answers we are not worrying about anyone else. The goal is to ask or tell to achieve whatever we are after. We are not taking into consideration that we might be disturbing someone else Flow. It is the same when we aren’t using contact in person but electronic medium, like email, telephone or IM chat. As it turns out, if you give somebody two things to work on, you should be grateful if they "starve" one task and only work on one, because they’re going to get more stuff done and finish the average task sooner. In fact, the real lesson from all this is that you should never let people work on more than one thing at once. Make sure they know what it is. Good managers see their responsibility as removing obstacles so that people can focus on one thing and really get it done. When I started my short research on multitasking it became more and more obvious to me how Agile, Lean and XP methodologies are actually trying to bring the software development process to the state where individuals are focused on single task, complete it in full and move on to the next one. With no interruptions comes better quality as well. I would like to mention and shortly describe some of the techniques that could help team members to achieve the Flow and Focus and produce results. There is more positives coming from pair programming but I will not write about it as it is a story for separate article. This article is only a short introduction and brief summary of my little research project. I’m also preparing the talk and presentation with much wider explanation of the concepts and techniques mentioned in here. Today I would like to write a few words about the recurring theme I observed at work. I call it a “Stiff AGILE backbone”. With some of the practices and processes, learned over time, we tend to stop thinking and ask questions if they are appropriate in the situation and if they work. Our agile backbone is kind of a stiff and we are keeping the same position all the time. It is important to REMEMBER that we need to keep an open eye into what we are doing, what are others doing, identify things that we could do better and execute the improvement. It doesn’t make sense to keep the same posture only because it worked few times before and it will work again. Every project is different and every project should evolve into “perfection”. 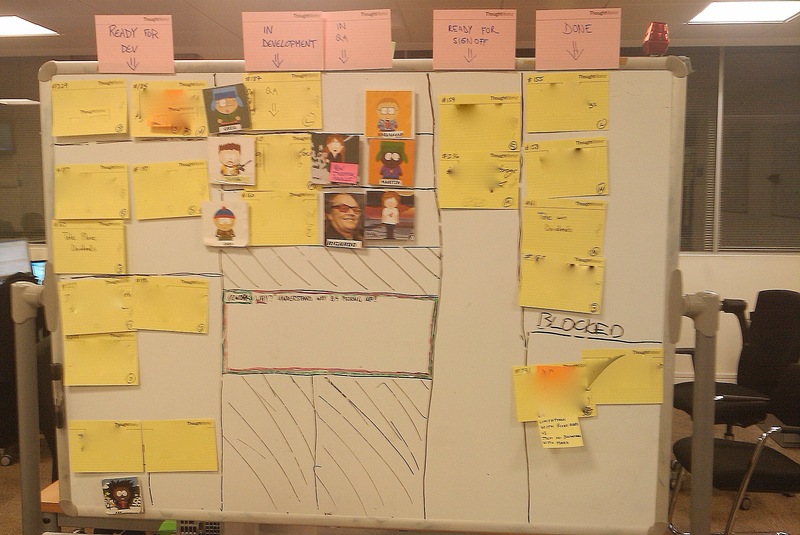 Everyone who knows or was close to Agile Software Development knows something about Story Wall. If by any chance you don’t, here goes. This is just one way of story formating and wording. As many people and teams as there are, wording can take different shape. For the purpose of the Wall we would normally have stories written on a index card in a bit shorter form with reference to more verbose version. The more verbose version contains acceptance criteria (we are using Mingle most of the time for that purpose). The wall is a physical place where we stick our story cards. Wall is a visual dashboard. It gives every team member current state of an iteration. This is a very typical wall setup. I worked with this shape of wall on many projects I was on. It is quite good, gives all important feedback through entire life cycle of a story. It is very important to point out the fact that story wall maps to a development process. The columns on a wall are direct map to the way we work. As you might already know it is essential to bend and improve the process in order to achieve best results possible. A very short break through the mentioned story wall. When Story got analyzed it moves into ready for development. Developer picks it up and works on it. When work on it is finished it is ready for being QA. If there are any bugs or hidden “features” it goes back to Development and so on. Once QA is happy with the story it is ready for Sign-Off. In any point in time if something stop story from being Developed/QAed/Analyzed it goes into blocked. Once the story is showcased it officially finished. In perfect world this sounds good, but … as software development world is one of the most imperfect, it doesn’t. For example, if stories are in development, QAs might have nothing to do. If stories are developed in “high rate” the QA column will pile up. Once story is in QA, devs are picking new story and start their work on it. When bug is discovered on previous one it is raised as bug, or story is moved back to ready for development. In our current project, we have identified some issues and decided to change, improve our way of working from the very beginning. As process changed so did our story wall. Once all the stories for iteration have been analyzed they are landing in Ready for Development. The team has 6 developers, as we are pairing, we are 3 pairs working on 3 stories at the time. This makes THREE streams of work that could be started at any time. We decided that we will create THREE vertical slots for that THREE pairs. This means that it is impossible to have four stories worked on at any given point in time. Next, we decided to eliminate QA column. It doesn’t mean that there is no QA, it means that QAs are involved in testing from very beginning. While the story is worked on, every single bit of new functionality is presented to QA to check it out. Developers are getting immediate feedback and very often tips for things that they could miss. In a mean time QAs are testing on their test environment and preparing automated tests. We have the luxury of heaving one QA per DEV pair. This makes little teams of THREE. When development is finished there is very little for QA to test as it was already done. At the end newly created automated tests are fired up just to confirm that all is done. As it is a team effort (a DEV pair plus QA) to FINISH the story, DEVS are helping in testing and in development of automated tests when needed. The story goes than into Ready for Sign-Off. It involved discipline to make sure that only one story is worked on at the time, until entirely finished and being ready for presentation to business sponsor. The THREE musketeers are responsible for the story to be finished and to improve the process. How did this process change affect our project. Short summary. We are very happy with this setup. What YOU think about it?